It’s Thanksgiving, and for me, that means Tofurky®! When prepared properly, I think this product is better than most Thanksgiving turkeys and chickens, mostly because it’s never dry. The directions on the box are pretty clear, but have a flaw common to recipes that want to sound gourmetish: a fancy ingredient. I see this all the time, especially among vegan and vegetarian fare. The glaze for basting will include soy sauce, salt, pepper, sage, and “Blackman’s Owl Switch,” an herb that grows only at the tree line in the Swiss Alps, and is only sold in the five most expensive hippie whole foods store in the nation. To get around this annoying trap, I used Kraft Italian salad dressing. Bam! 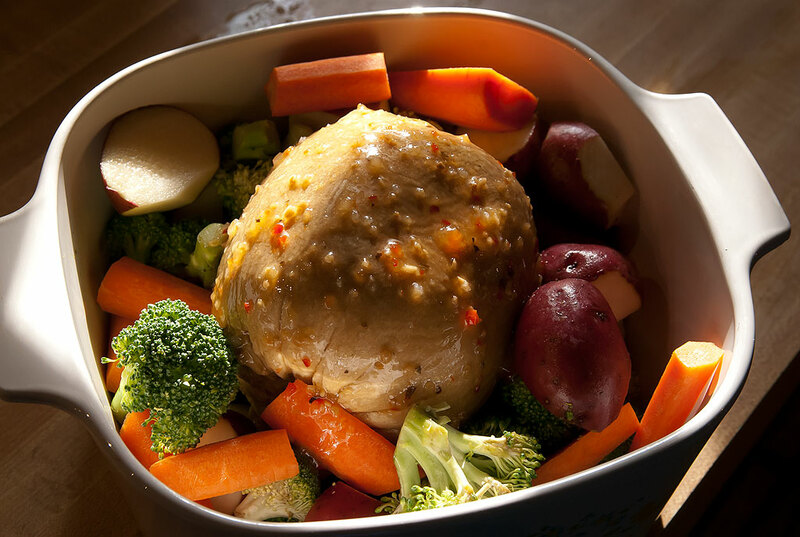 My Tofurky sits in its cooking dish surrounded by carrots, red potatoes, and broccoli, basted with Italian dressing. This is going to be good. 1. The “just 30 more minutes” bird. For some reason, no one can correctly estimate how long it takes to cook a chicken or turkey. 3. The “2 p.m.” dining time. Why don’t we have Thanksgiving dinner at a dinner time? 4. The microwave traffic jam. When it’s leftover time, even if you have two microwave ovens like we do, it takes 30 minutes to heat up all the meals for everyone. We don’t have turkey, because Marline said she never liked it, and then I realized I’d never liked it either. And we eat at lunch time. I’ve never understood the 2-4 p.m. start times. I’m scared to try tofurkey because my oven thermometer doesn’t have a setting for it. How do you know when it’s safe to eat. And, regarding my probe, where do I stick it? Will eating Tofurkey make me sleepy?